BPA Council Members are elected by the membership to represent them at meetings (typically held 7 times a year) and manage the governance and policy of the BPA as the National Governing Body for Sport Parachuting in the UK. From 2017, the Council will be composed of 10 elected members and 2 independents. Council members sit on the main council (board of directors) as well as one of the 3 sub-committes - Communications, Development, or Competitions. They are joined by co-opted (non-voting) committee members relevant to the particular committee, e.g. The editor of Skydive The Mag is co-opted the Communications committee and reps for each discipline are co-opted to the competitions committee if not on Council. Council do not directly make changes to the Ops Manual; this is done by the specialist Safety and Training Committee (STC) which is currently made up of the Chief Instructors of all BPA-affiliated dropzones. 19 candidates were nominated for the 10 elected Council member seats; their manifestos are available on the BPA website. Voting runs from Monday December 19th 2016 until noon on Thursday January 12th 2017. 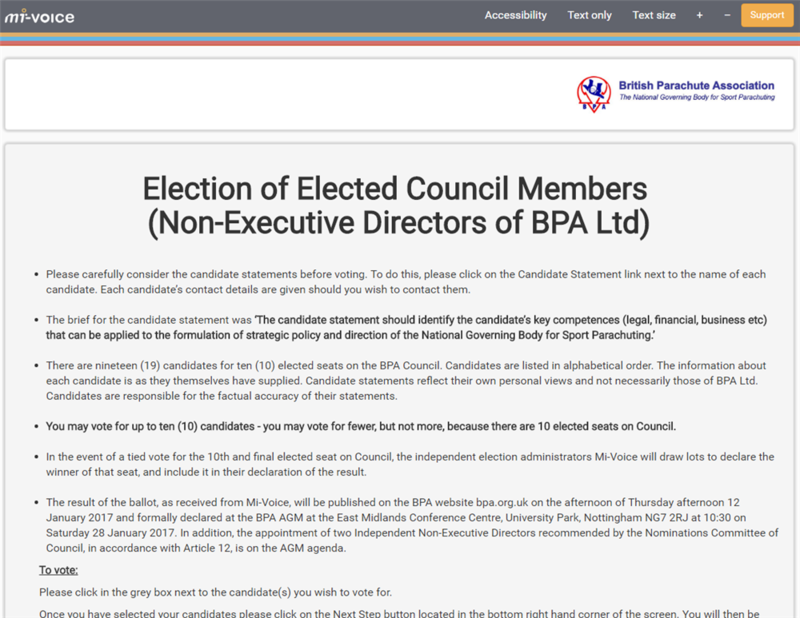 Read candidate statements carefully, get in touch with them if you have any questions (their contact details are provided on the statements) and talk to other BPA members experieced with the BPA (such as current and former Council members). Try to focus on chosing people who you think will bring the right skills and integrity to the table and avoid voting just based on who you know! If you are a full BPA member you will have been sent an email (unless you have opted for postal communications) from Mi-Voice who are the independant administrators of the election. Your email contains your personal link to cast your votes. You can vote using the Mi-Voice voting page. In the election, you have up to 10 votes and the successful candidates will be those with the 10 greatest number of votes. It's important to note that you don't have to use all of your votes. How can I get more involved with the BPA? Alongside Council, volunteers are required for some of the committees and this is a great way to get involved without the pressure of running for Council - see the BPA Facebook post below for more information and email the BPA by 3rd Jan if you are interested. All full BPA members are also welcome to attend meetings as an observer. Proposed meeting dates can be found on the calendar. This is a great post that needs to be shared more!